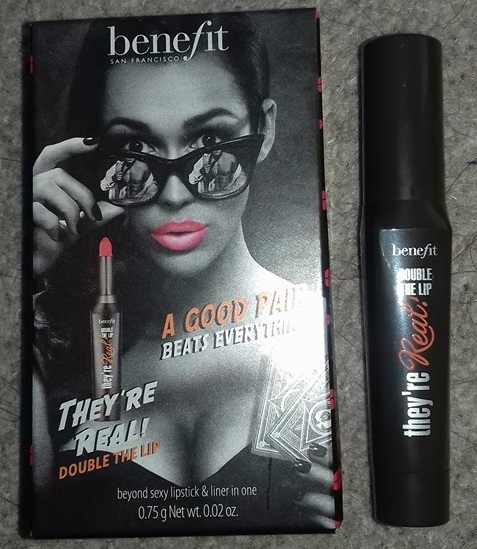 Let’s take a look at the packaging, this is a mini sample that came free with a magazine so it is slightly different but it is reminiscent of the They’re Real Mascara and They’re Real Eyeliner Pen so it makes sense for the brand. I do like the artwork though I did think the lips looked strange, personally I find that ombre lips work better if they’re more subtle but that’s just me. The travel size of this is worth £10.50 but since it takes a while to use up a lipstick you get plenty of product for your cash – I would advise testing the travel size first to see if you like it. 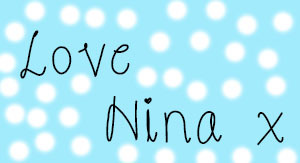 “Get fuller-looking lips in one easy stroke wherever you are, with They’re Real! Double The Lip mini in Revved-Up Red. This lip liner & lipstick in one features a Custom Teardrop Tip that grabs and defines your lip line and fills in lips with complementing colour for the appearance of volume and dimension. This semi-matte lipstick comes in neutral to bright shades for visibly fuller, sexier lips. *consumer panel survey of 110 women after 1 week. A quick thing to note is the lack of testers for this product, personally I feel that 110 women is far too little to use to generate a product claim, I also think that 20 people again is a minute pool so I am dubious about that, I think it would be better to remove those bullet points and stick to the description personally but that’s just me! As you can see the lipstick is split so a third of the lipstick is the part for filling in your lips and the top part is the liner. The colours doo look very different when you look at the lipstick this way however, I found that once you apply them both together they are indistinguishable so don’t worry about that! The shade is both bolder and paler than I envisioned which is quite surprising. I looks very bold in the tube but when you apply it has more pinky red tone to it which translates onto the lips. 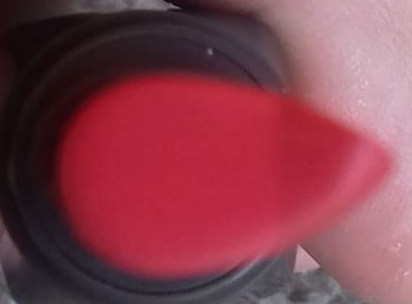 You can see where I pressed down on the left to build up that red shade but I was surprised to see that this was pinkier than I had anticipated. I was also expecting a matte or satin finish so the texture and finish surprised me. As you may be able to tell the formula is very balmy and slippery, I personally found thsi a little off-putting for several reasons. Firstly, the formula of the entire thing is slippery which means that the lip liner function doesn’t work too well. I didn’t notice any bleeding but it did feather slightly and I struggled to get a crisp line. With a lip liner they’re typically drier to hold the lipstick in place but that’s not the case with this. I also found that the formula sat on the lips but didn’t sink in like a balm, it emphasised any texture even after exfoliating my lips and move around more than I would have liked which gets me onto my next point. This is a red lipstick and red = obvious smudging! With a colour as bold as red you need the lisptick to stay on the lips so to choose a glossier balmy formula struck me as a strange choice. This is the product on me, personally I found that it looks darker in the centre of my lips even though I used the liner on the outside! 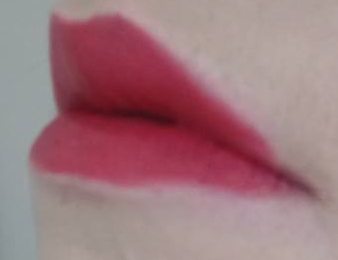 You can see that this hasn’t made a terrible mess however, it isn’t perfectly even, I struggled to get this formula to stay in place and the slippery texture meant that getting a crisp line was impossible I also found the tip of the liner to wear down much quicker than the rest of the lipstick so bear than in mind! Bonus points were that the lipstick smells nice and isn’t as harsh as a true red or blood red but even so I didn’t find this to be flattering on me. My overall thoughts are that this is just a gimmick, from the slippery formula to the built in lip liner which isn’t a lip liner at all – this just didn’t deliver on what I expected and I found it harder to work with than necessary. Personally, I wouldn’t purchase or recommend, it’s a nice idea but the final product doesn’t really make sense for the purpose to me. I think if you are on the hunt for products that will make your lips look larger then invest ina lip liner it will save you a lot of time and look better in the long run! The Benefit They’re Real! Double The Lip & Liner In One Travel Sized Mini Revved-Up Red is available from Boots for £10.50. I hope that you enjoyed this post and if you did please hit the like button, let me know in the comments if you have tried these lipsticks and if you like an ombre lip. 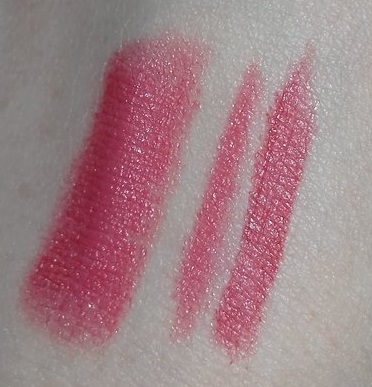 This entry was posted in Lips and tagged beauty blog, Benefit, disappointing products, double the lipstick and liner, high end, lucia widdop, ninarossbeauty, ombre lip, revved up red, they're real. Bookmark the permalink.